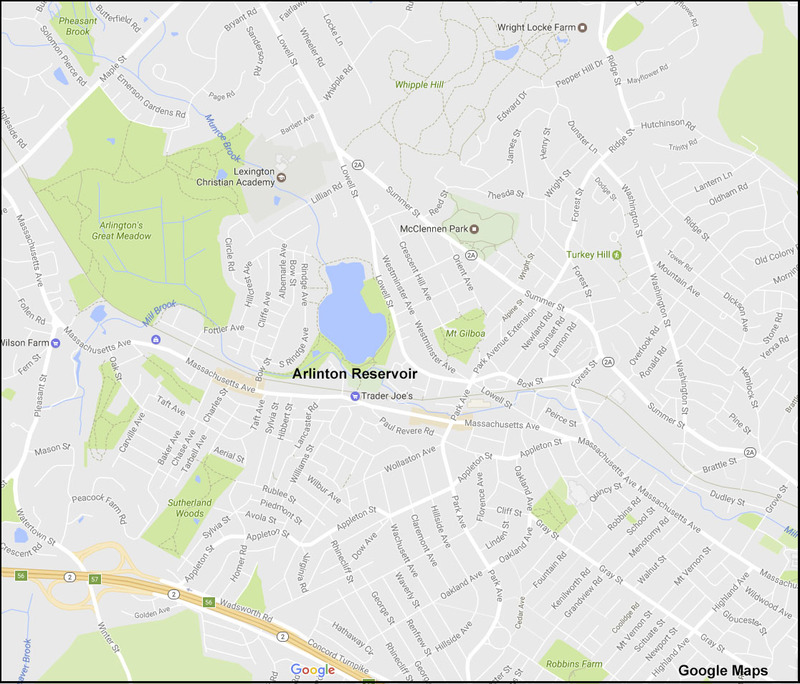 Map of the Arlington Reservoir and surrounding streets. The "Res" is a man-made reservoir and was built as part of Arlington's water supply system in the late 19th century, but that use was soon discontinued when Arlington joined the metropolitan system. The Res is fed by Munroe Brook, which enters from Lexington in the northwest , and it feeds Mill Brook, which runs through Arlington Heights parallel to the Minuteman Bikeway. Even Though about half of the Res is located in Lexington, the Town of Arlington owns all of the water and surrounding shore area. The fenced Beach area along Lowell Street is a popular summer swimming area with lifeguards and treated water. A perimeter path of about 0.9 miles circles the Res and is a regular stroll for many walkers. While taking the walk, stop at the Wildlife Habitat Garden adjacent to the overflow spillway to enjoy many attractive native plants. The water area is a habitat for several types of fish and some very large snapping turtles. The Res is also a hot birding spot in the spring and fall and nearly 150 species of birds have been spotted here. This map is from the Arlington Reservoir Brochure which can be downloaded here. The Res is located in Arlington Heights between Massachusetts Ave. and Summer St. The best access year around is from Hurd Field (behind Trader Joes) via Drake Road off Massachusetts Avenue. The beach parking lot, on Lowell Street, is also open all year (near the intersection with Westmorland Rd). From the Minuteman Bikeway enter through Hurd Field (this is a little past the Park Avenue Bridge and Arlington Coal and Lumber). How to get to the Reservoir. The Reservoir is approximately 47 meters (155 feet) above sea level. By comparison, Spy Pond and the Lower Mystic Lake are both just about 1 meter above sea level. The primary feed to the Res is Munroe Brook (also called North Brook) from Lexington. The Arlington Great Meadows (in Lexington) is drained by Sickle Brook which does not feed the Reservoir but flows below the earthen dam on its Southern edge to join the discharge from the Res to form Mill Brook. Mill Brook then flows north of Mass Avenue to discharge into the Lower Mystic Lake at Arlington Center. The dashed line through the center of the Reservoir is the Arlington-Lexington town boundary. The railroad line (with crosshatches) is now the Minuteman Bikeway. The contour lines are at 3 meter (10 ft) intervals. The image is scanned from the USGS Boston North topographic map (42071-D1-TM-025) 1985. Fall water depth in Reservoir with dam gate down. Water depth in Summer is about 6 feet higher.